The three points that had the greatest impact on me from the book Leading with Integrity were globalization and technology, servant leadership and competence, and teaching character. Each of these sections is very relevant. Globalization and Technology In today’s world the use of technology and globalization is growing faster and faster each day. Technology is becoming more globalized with the continued innovation that is taking place in many countries throughout the world. Companies are gradually becoming more globalized by outsourcing work to other countries where they find the cheapest labor. Companies are building warehouses at offshore locations and then setting up telecommunication systems to be able to conference call from one location to another. As the book points out, the number of overseas phone calls is drastically increasing. With the increase in globalization, companies are able to grow and expand into many nations. The globalization is very good, but it is essential that managers, as well as, other company leaders continue to adhere to ethical standards. Without a strong backbone of ethical behavior, no company will succeed long-term. Servant Leadership and Competence Servant leadership occurs in a company when the leaders seek the overall good for everyone involved. Servant leadership is seen in leaders that do what is best for the employees and the community and not just themselves. Servant leaders are found in many organizations at all levels of leadership. Servant leadership is defined as the character of the company or individual. Competence refers to the knowledge of companies, individuals, and the government. In today’s world it is very important that companies have both servant leadership and competence. Servant leadership (character) helps to better the company, community and individuals. The competency allows the community, company and individuals to not only have the ethics to do the right thing, but also the knowledge to make the right choices. Teaching Character Character is very important. It is defined as the ability to take learned ethical principles and put them into practice when making decisions. Ethics are taught in many places. They are taught in the home, school, church, etc. In today’s world, ethics that form character are more important than ever. In a world of everyday deceit in well-known companies, it is becoming more difficult to find individuals with strong character. 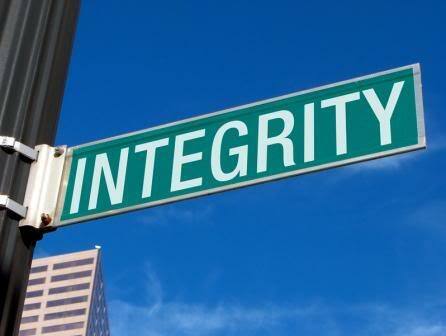 In my life, I have always strived to be a person of great integrity. I have always tried to follow the good examples of the leaders in my life. I always want to be thought of as a person with good character that is very trustworthy. How do you cultivate integrity?